Any knowledgeable beauty guru will tell you that caring for and protecting your skin is paramount in achieving a healthy complexion. Noxidoxi knows this and has dedicated its entire line to protecting skin against pollution. Everywhere we go our skin is exposed to airborne pollutants that can lead to premature aging, clogged pores, and dehydration. By protecting skin and fighting off these pollutants, Noxidoxi can restore skin so it can get healthier on the inside, and look amazing on the outside. The Science | Pollution dextology rids the skin of pollution and its harmful effects. It helps eliminate dead skin cells that can prevent skin from regenerating, reactivates natural cell renewal, and protects pores from being further clogged by pollutants. Detox Cleanser & Makeup Remover | This cleanser gently removes makeup while balancing skin at the same time. Its rich formula works without the addition of water and feels very soothing on the skin. 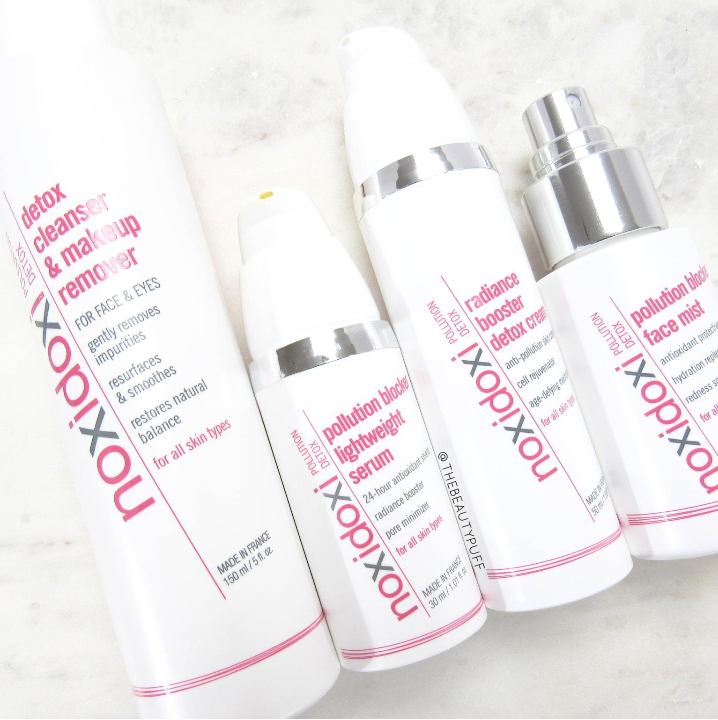 Afterward, I still use a toner to remove residue and continue with my skincare routine with other Noxi Doxi products. Pollution Blocker Lightweight Serum | This light serum gets applied before your moisturizer to protect and nourish skin for 24 hours. It also helps to reduce the appearance of pores and has a nice fresh scent, which I love. Even on no-makeup days I'm always wearing this serum to keep my skin fresh, hydrated and protected! Radiance Booster Detox Cream | This cream works to rid the skin of dead skin cells while boosting hydration with hyaluronic acid. It helps even tone, repair fine lines and wrinkles, and balance skin for a healthy complexion. This cream also has an amazing light scent that's very comforting at the end of a long day. Pollution Blocker Face Mist | For an extra boost or on-the-go protection, this face mist is a great pick-me-up during the day! This is particularly nice if you're out at the beach or enjoying the outdoors and want protection without having to touch your face. It also feels really refreshing in the summer heat. Is your skin protected? Read more and shop Noxidoxi products below.